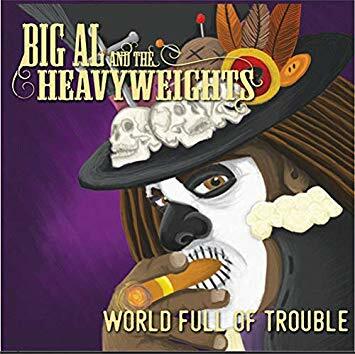 I just had the opportunity to review the most recent release, World Full of Trouble, by Big Al and the Heavyweights and it's a lot of fun. Opening with title track, World Full of Trouble, Lance Younger on lead vocal hits it hard with Destin Thibodeaux on hot harp and crisp guitar riffs from Bob Margolin. Tight drumming by Big Al and bass by Dean Galatas keep a tight groove under the rumbling keys of Wayne Lohr making for a solid opener. With a funky bass line by Galatas and a real R&B sax line by Lance Ellis, Fool For You has a nice groove. Wath, BB King like guitar phrasing by Younger on Testify, over gospel like backing vocals by Donna Slater and Cathy Pace give younger great traction for top radio track on the release. Very nice. Country funk on Big Old Rusty Car really works nicely with Billy Preston like organ by Lohr, and hot sassy sax work by Ellis. Very cool. Conjuring the bluesy soul of Blood Sweat and Tears, Two Wrongs Don't Make A Right, has a swaying rhythm and Thomas like vocals with a great bass line, nice harp work by Thibodeaux, chasing drums by Big Al and really tasty guitar riffs by Younger. Wrapping the release is bluesy, Something Got To Change. Ellis lays back and wails on sax and Younger's always super vocals make this an excellent closer for a really nice release.